Except for the last hour of his life, Thomas Cranmer made no heroic stands and lived no radical lifestyle. The burning of reformers Nicholas Ridley and Hugh Latimer. Where was Thomas Cranmer during this unscrupulous chapter in the English Reformation? The English Reformation, more than others, was the work of the principalities and powers. Who were Ridley and Latimer? 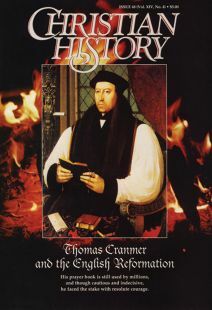 Chronology of key events related to Thomas Cranmer. What was it like to be on the losing side of England’s Reformation? It’s not easy to take a balanced view of doctrines like predestination and Communion—but Cranmer did. Why, and how, everyone should read the Bible. The cadences of Cranmer’s Book of Common Prayer continue to nurture Christians worldwide. Contrition in the Book of Common Prayer. The distinctive legacy of Thomas Cranmer, and the Anglican “middle way” today. Resources to assist you in further research on Thomas Cranmer and the English Reformation. It scandalized many Christians and made Time magazine—so, like whatever happened to the Jesus Movement?